An Industrial Way Forward Agreement signed on 10 March by the CEOs of EDF and Nuclear Power Corporation of India Ltd (NPCIL) sets out the industrial framework and planned timetable for the implementation of six EPR reactors at Jaitapur, as well as the roles and responsibilities of the partners. 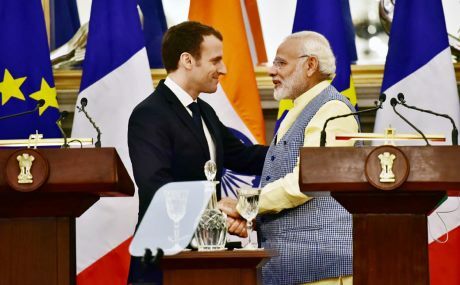 The agreement was signed by EDF chairman and CEO Jean-Bernard Lévy and NPCIL chairman and CEO Satish Kumar Sharma during a state visit to India by President Emmanuel Macron of France. Under its terms, EDF will act as supplier of the EPR pressurised water reactor technology, and will undertake all engineering studies and component procurement activities for the first two of the six reactors. Responsibility for some purchasing activities and studies for the other four units may be assigned to local companies, reaching potential Indian localisation of 60% for the last two of the six reactors. EDF will also provide NPCIL with its "valuable experience" from the construction of EPR reactors. As owner and future operator of the Jaitapur plant, NPCIL will be responsible for obtaining all authorisations and certifications required in India, and for constructing all six reactors and site infrastructures. EDF and its industrial partners will provide assistance to NPCIL during the construction phase. According to EDF, Jaitapur, in Maharashtra state, will be the biggest nuclear power project in the world with a total generating capacity of around 10 GWe. The company said the 1600 MWe EPR reactor is "particularly suitable" for a country such as India which is undergoing rapid growth and has a mature electricity system. EPRs are currently under construction at Flamanville 3 in France, Olkiluoto 3 in Finland and two units at Taishan in China. Taishan 1 is expected to be the first EPR to come online, starting up later this year. The framework agreement provides for EDF to submit a preliminary tender within weeks, with the objective of producing a binding tender towards the end of this year. Lévy said the agreement marked a decisive step in the development of the Jaitapur nuclear project. "[W]e can now envisage with confidence the rest of this essential project for India and for EDF," he said. Jaitapur is to be the flagship project of a collaboration which started with the signature of memorandum of understanding by French company Areva and NPCIL in 2009. In a joint statement, Macron and Modi "noted with satisfaction" the conclusion of the Industrial Way Forward Agreement. The leaders reiterated the goal of commencing works at Jaitapur "around the end of 2018" and encouraged EDF and NPCIL to "accelerate" contractual discussions. They also "welcomed" the two parties' "shared understanding" on the enforcement of Indian rules and regulations on civil liability for nuclear damages applicable to the project, and the "regular engagement" between the two countries' nuclear energy organisations and regulators. EDF also announced the signature of two cooperation agreements with French and Indian industrial players, setting out operational foundations for the Jaitapur project. An agreement with Assystem, Egis, Reliance and Bouygues on the installation of an engineering platform for studies within the scope of the Jaitapur project will see the five companies define rules for collaborative work with a view to creating a joint-venture. EDF will hold 51% of the joint venture and will be responsible for engineering integration. The second agreement, signed with Larsen&Toubro, AFCEN - the French nuclear codes and standards association - and Bureau Veritas, covers the creation of a training centre to train local companies on the technical standards applicable to the manufacture of equipment for the Jaitapur project. India has 22 operating nuclear reactors representing 6219 MWe of generating capacity. Six reactors totalling 4350 MWe are under construction, including a prototype fast breeder reactor and one Russian-designed pressurised water reactor. Construction is planned to begin on 19 further units within the next few years, including ten indigenously designed PHWRs which are scheduled to start up by 2031 as well as reactors from overseas vendors.